I found this article quite interesting: Unauthorized biography spills Simon Cowell secrets that not only reveals that Cowell gets botox, vitamin drips, and colon cleanses regularly, but it reveals some of his struggles he’s had in the music and television businesses. The book is written by Tom Bower, titled Sweet Revenge: The Intimate Life of Simon Cowell and focuses a lot on the money and power of Simon Cowell as well as his early struggles and humiliations in the business. According to this Associated Press article: While Bower has been openly hostile to some of his previous subjects — he called Gordon Brown a ruthless bully and Conrad Black a crook — he has a soft spot for Cowell. “He’s not a crook,” Bower said. “So far he hasn’t sued me. And it was good fun. I am excited to check this book out! I am always interested in books about powerful, rich people and how they got to where they are today. 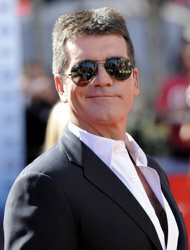 Plus, I find something about Simon very endearing and I can’t help but like him. Click here to get your copy of Sweet Revenge: The Intimate Life of Simon Cowell on hardcover. Posted by amandatalkstv on April 21, 2012 in Misc Entertainment News and tagged American Idol, Biography, Book, Simon Cowell, Simon Fuller, Sweet RevengeL The Intimate Life of Simon Cowell, Tom Bower, X Factor.